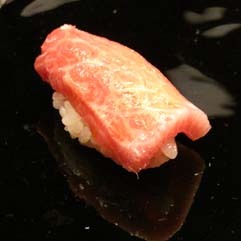 If you would like try some excellent Edomae (classic Tokyo-style) sushi but are intimidated by the stern and exacting atmosphere depicted in recent movie “Jiro Dream of Sushi,” the tiny (counter-only seating) and accessible Sushi Kanesaka might be just right for you. 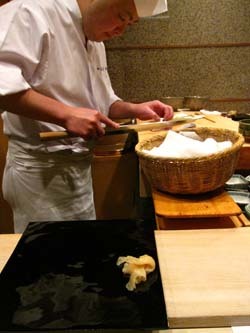 Located in the Ginza area and run by chef-owner Shinji Kanesaka, the sushi here is of a superb quality, as well as distinctive. 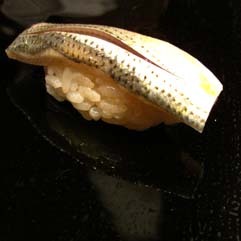 So much so, in fact, that loyal customers call this type of sushi "Kanesaka style." Of course, care is taken to serve only the best-quality seafood of the season, but the rice is a little on the firm side, and red rice vinegar is used, which imparts just a slight pinkish hue and slightly different — perhaps brighter — flavor. 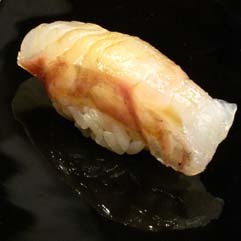 As in the style of the high-end sushi establishments, the freshly cooked rice is gently formed (so that air pockets still exist within the rice) and served one at a time, so that the rice is ever so slightly warm to the touch. 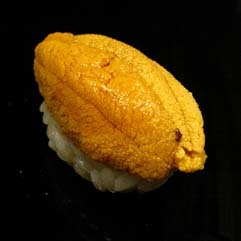 The result is truly delicious, providing a good base for the amazing neta (sushi toppings), deserving of its ranking of two Michelin stars. 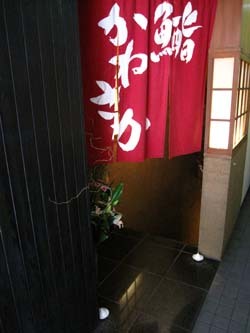 Above: The noren (curtain) at the entrance. Below: The elegantly simple and modern interior makes good use of the small space. Chairs are cushioned and comfortable, inviting guests to linger. 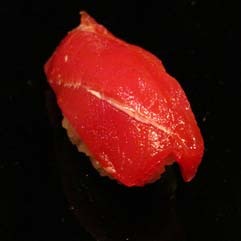 Below: Making great sushi takes concentration. 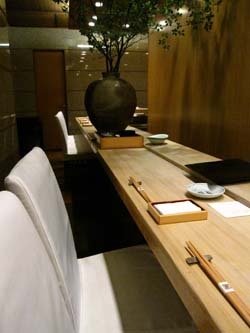 Tip: As with all restaurants that are listed in the Michelin guide, you must make a reservation well ahead of time. English is not spoken and the menu is in Japanese. 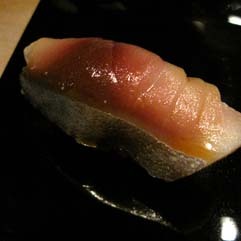 As we at Savory Japan are always seeking value (especially on a first try), we ventured to Sushi Kanesaka recently for lunch. There are two kinds of lunch sets where only sushi served. 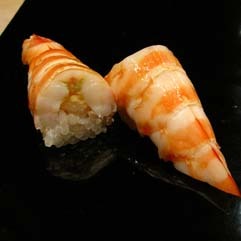 Since we wanted to get our fill of as much sushi as possible, why fill up on soup and other dishes? 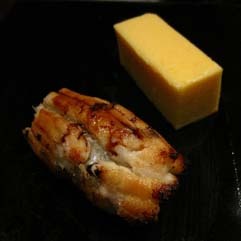 The ¥10,500 course had 16 varieties, enough to sate our appetite and curiosity. Reservations are recommended, and can be difficult to obtain on the weekends., although with Tokyo still feeling some of the lingering effects of last year's Tsunami, there are no longer daily lines out the door. English is not spoken, so you might want to have a Japanese friend make a reservation and place an order in advance for you.